Hedge fund titan Bill Ackman sets his sights on P&G's CEO. Bill Ackman, the activist hedge fund manager who most recently made headlines over his big short position on Herbalife, zeroed in on Procter & Gamble at the Sohn Investment Conference in New York Wednesday. The CEO of Procter & Gamble (PG) is one busy man, but that doesn't mean he's solely focused on his work at the helm of one of the world's largest corporations. Bob McDonald, who's led P&G since July 2009, served on the board of 21 different organizations, including Xerox (XRX)as of early 2012. And Ackman thinks that may be more than a few too many. "We make the conservative assumption that just attending board meetings and not including travel time, this accounts for 25% of his time," Ackman said during his presentation. Related: Can Procter & Gamble CEO Bob McDonald hang on? A P&G spokesperson disputed Ackman's comments and said that McDonald serves on just seven boards. Only one, Xerox, is a corporate board, he said. Still Ackman made it clear from those thinly veiled comments that he wants McDonald out. He said he's willing to give McDonald two to three quarters to get the company in better shape. By better shape, he wants to see at least 5% annualized growth and some major cost cutting. In both of those metrics, P&G trails its peers, said Ackman. Ackman called P&G's board "first class" and said he expects the board to make the right decision. Ackman holds roughly 1% of the consumer product maker's shares, making him one of P&G's top stakeholders. He's been a vocal critic of the company's management and its financial performance since disclosing his stake last year. Should McDonald fail to turn things around quickly enough, who does Ackman think should step in? He didn't specify, but said there are several quality internal and external candidates. Ackman has been known for bringing new leadership into his investments, though not all his moves turn out as planned. 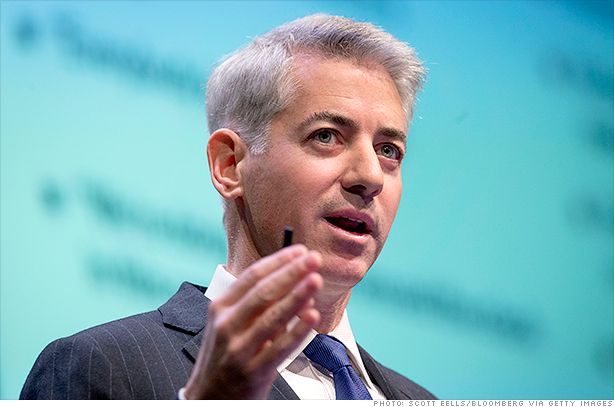 Ackman also stayed silent on his big billion dollar short position in multilevel marketing firm Herbalife (HLF). The Sohn conference is known to produce wild stock gyrations, as investors rush to follow the bets that major hedge fund managers make for or against stocks. Ackman's talk didn't move P&G's share price much. But several other stocks were whipsawed. Corvex Management's Keith Meister told investors to buy wireless data providers Level 3 Communications (LVLT) and TW Telecom (TWTC). He deemed Level 3 to be a long-term consolidator in the industry. TW Telecom, by contrast, could be an acquisition target down the road. Shares of both companies shot up about 7%. Shares of Yellow Pages company Dex Media (DXM) rallied 30%, after noted short seller and Japan bear Kyle Bass outlined a case for long-term growth as the company moves into digital media. Clear Channel Outdoor's (CCO) stock gained more than 7% after Mitchell Julis of Canyon Partners gave the billboard firm a thumbs up. Ackman tells mall operator General Growth Properties again: Sell! Hedge fund manager Bill Ackman is used to getting his way, and CEOs have been finding it more and more difficult in recent years to resist his wiles. Mall operator General Growth Properties (GGP), and its majority owner Brookfield Asset Management, have been feeling the heat as they oppose Ackman's attempts to force a sale to rival Simon Property Group (SPG).